If you know me well, you know I love candy corn and Peeps. but all the CUTE things that are made in their image. Including - dressing my child up like one of them. 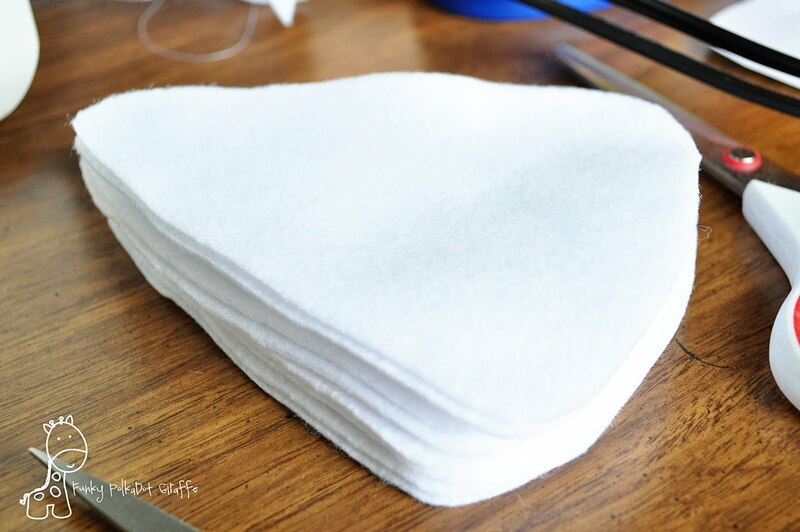 So when I saw THIS tutorial over at MADE this Spring I was in LOVE. 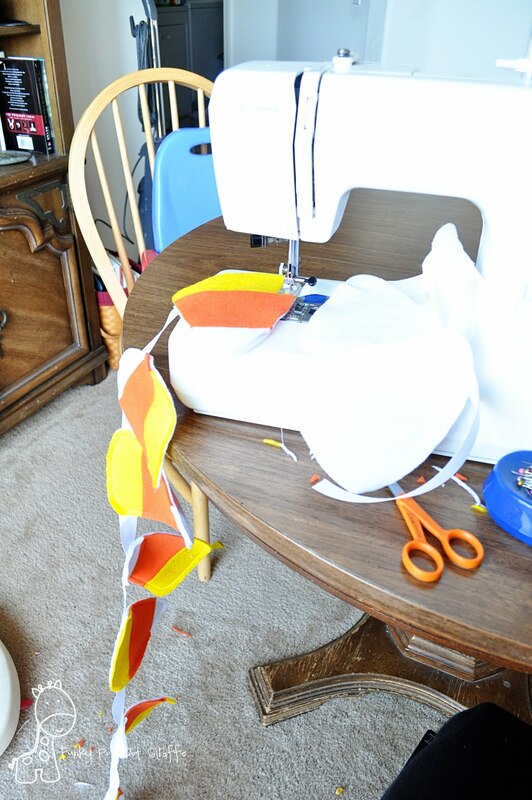 So, I took what I learned from the Peep tutorial and made this Candy Corn Bunting. I am over the moon with how it turned out. So, candy corn lovers unite and let's do this thing! so all my strips were varying lengths. 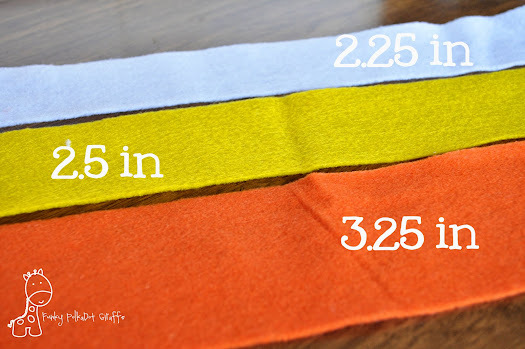 Match up your lengths of felt and lay them in candy corn colored coded order. 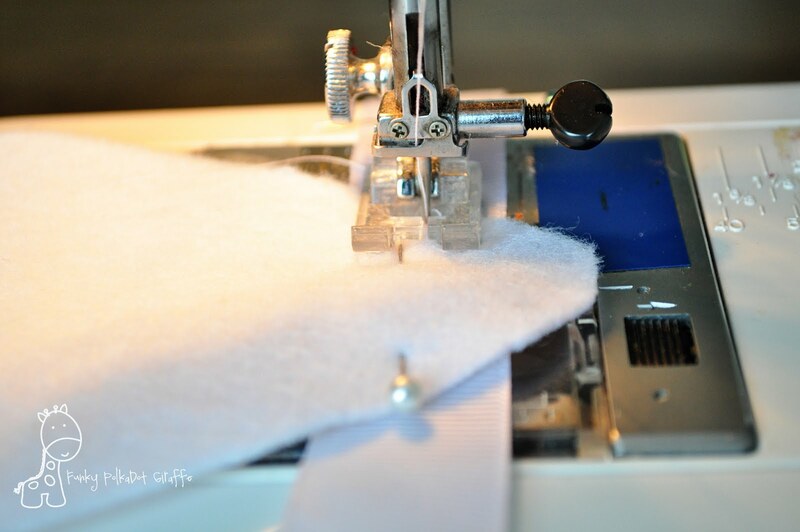 Then sew them together with 1/4" seam. 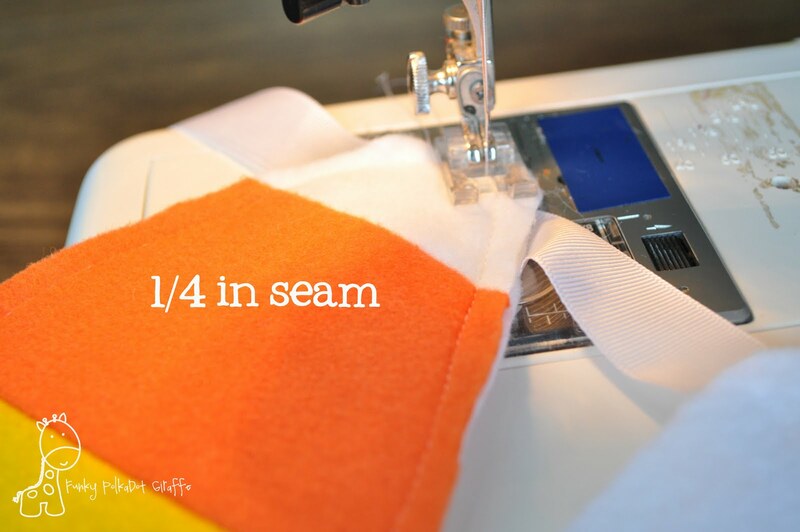 Make sure your seams both end up on the same side. When you're done, you'll have a pile like unto this! Press your seams open. Ugghh, I know. I tried to avoid it. The product was not desirable. from your candy corn colored strips. Now, I debated about how to sew this and put it together. First I sewed 2 candy corns together, flipped it, and top stitched. Then I sewed 2 candy corns together and left the edges raw - too funky. 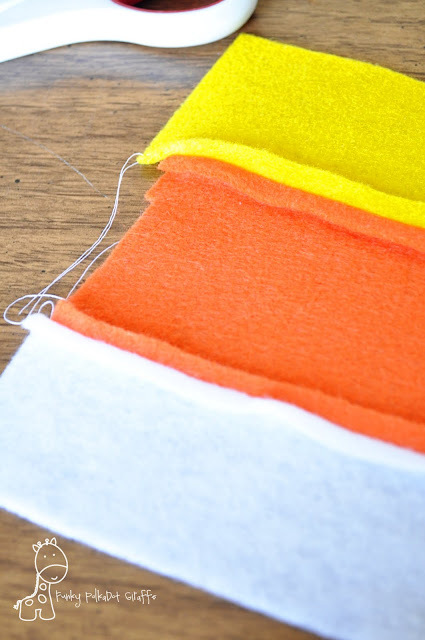 I finally settled on sewing a color blocked candy corn to a plan white one. 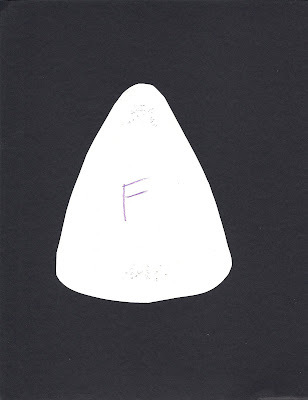 Cut white candy corn shapes for your backs. Now this should probably be step "1", but decide how long you want your bunting to be. I decided I wanted it to be 72 inches long. 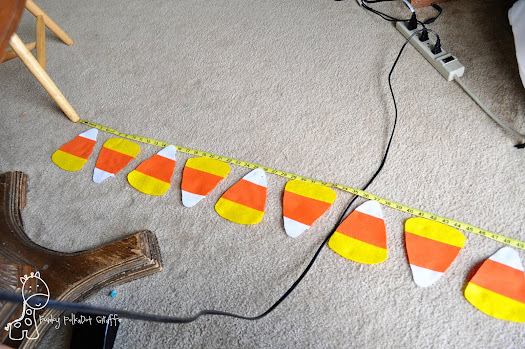 I laid out my candy corn to find out how many I'd need. 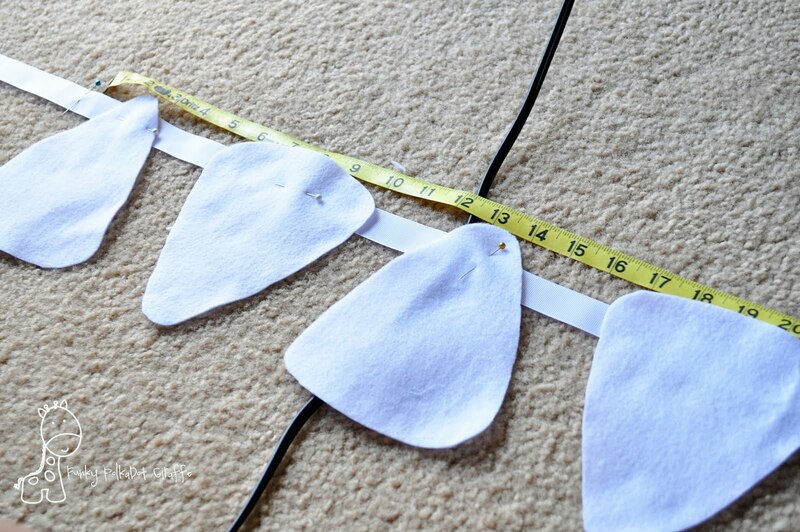 For my 72 inch bunting, I needed 11. 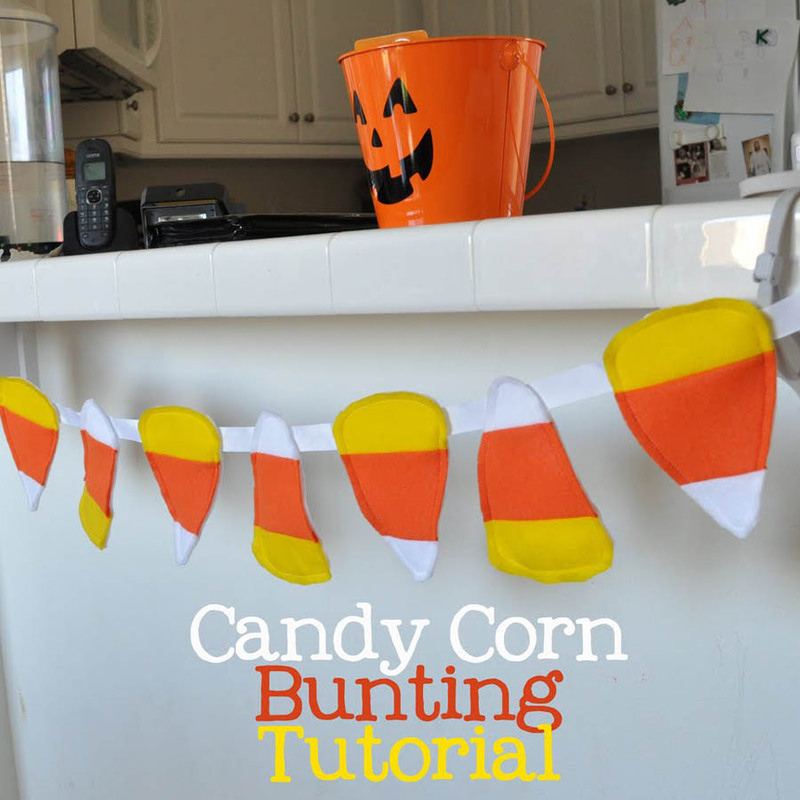 Cut your ribbon and pin the plain BACKS of your candy corns to the ribbon. I started pinning 6 inches in from the ends. than I need, because I want longer dangly ends. but you can put them all the same direction if you want to. 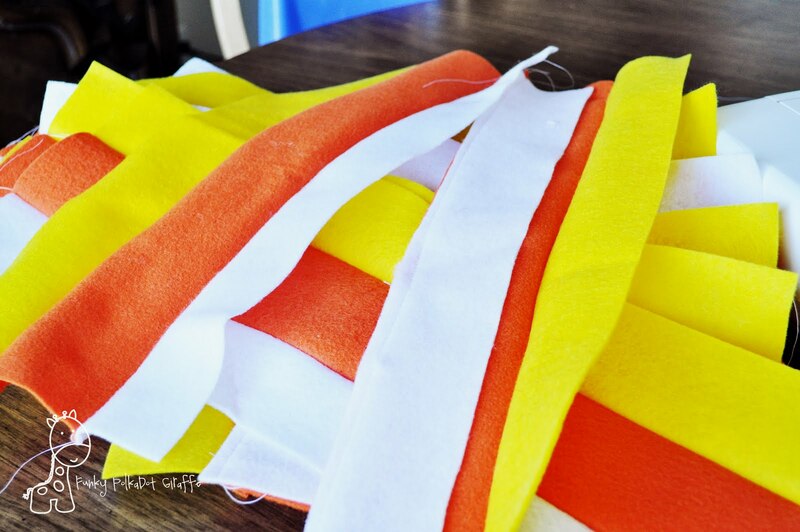 Sew the candy corn backs to the ribbon. but I didn't cut my thread and then I moved to the next back. Lay the candy corn fronts on the backs, and sew all around with a 1/4" seam. Keep going until all your candy corn fronts are sewn to their backs! And 6 hours later . . .
(P.S. Aren't you so proud I cleaned off the bar for the final shot? Here is my candy corn pattern. Feel free to use it if you want to. I'll be linking up HERE! Please feel free to use this tutorial for your personal use. Wow-ee! I love it. I love the cutsie stuff a lot more than the scary halloween stuff. Thanks for putting together a tutorial! great job!!! I will so keep that in my list of projects to do. I lOVE IT! so cute! found ya on sassy sites! your newest follower! I love candy corn! Thanks for this great tutorial! I will be giving this a try. 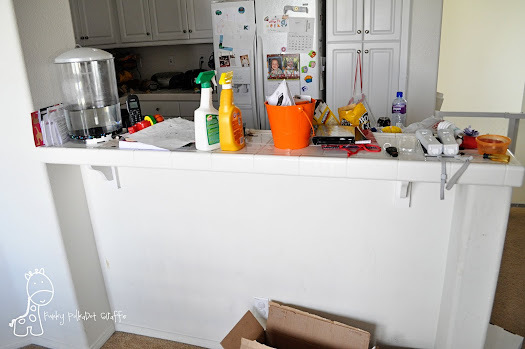 I'm following from Sassy sites, can't wait to see more of your blog! I would love a follow back! Holy manoly...that is more then fabulous! Seriously. I am completely IN LOVE WITH IT. Definitely going to be doing this one! I am so glad you are going to link it up. Happiness to it. Thank you for doing a tutorial on it too. Love. Love love. This is the cutest idea!!! Thanks for the tutorial. I think I'm going to make some for my son's room! Thank you for your comment! I love your blog :) I have all boys so I don't know the first thing about hair bows. Would you ever want to do a tutorial on my blog? That monkey and banana pair was TO DIE FOR cute!!!!!! really cute and simple. It is spooktacular. Now that is FUN! It such a nice splash of color and cute too. 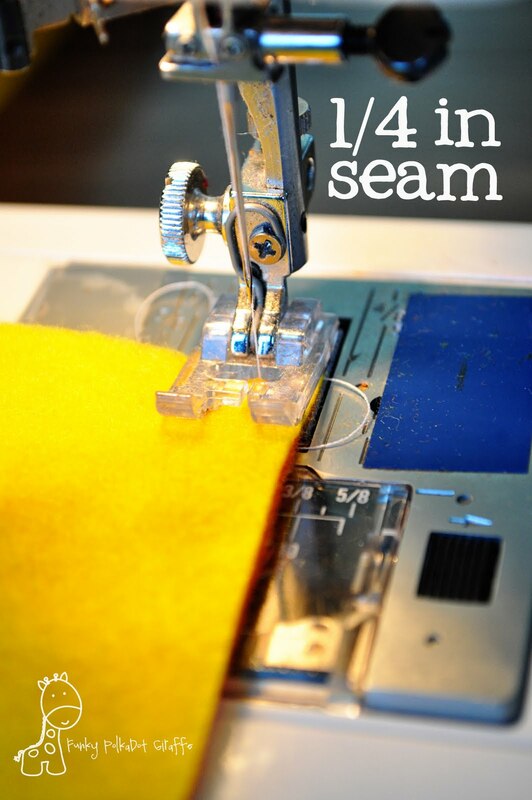 Would love you to join me at A Crafty Soiree, every Thursday. 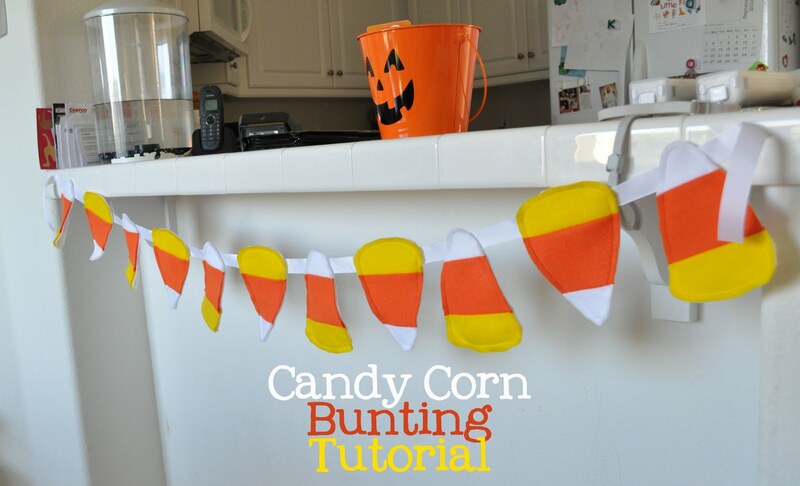 Really cute and I would even consider making it even though I don't like to eat candycorn either. 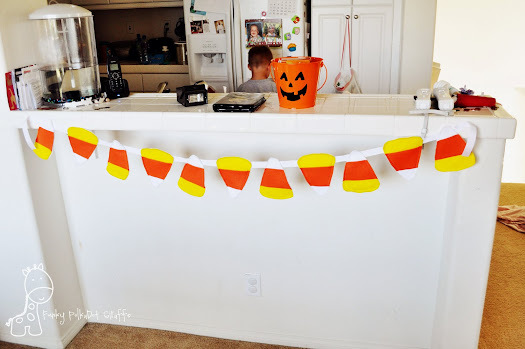 love candy corn & this banner is the cutest. thanks for linking this on the FALL FESTIVAL! VERY cute! I loved the peeps as well from Made and great twist on the project! Great job! So cute!!! It's funny -- I made a candy corn pennant this week too. Yours is adorable! i love the bright colors and how happy it looks. Fantastic! This is soooo cute! Good job! This is so cute. My daughter LOVES candy corn and would love this! That is too darn cute! Love the way it turned out, way to stick with it with all the interruptions. 6 hours, wow. too cute! I love candy corn stuff. 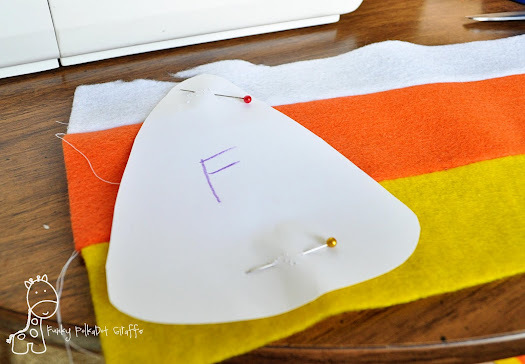 I crazy about anything candy corn and this is one of the coolest candy corn projects ever! Love it! Super cute! I love how you expanded on what Dana did at MADE. Great job! that looks great! candy corn is my favorite, and it always signifies the start of fall to me when the halloween candy is out in the stores. 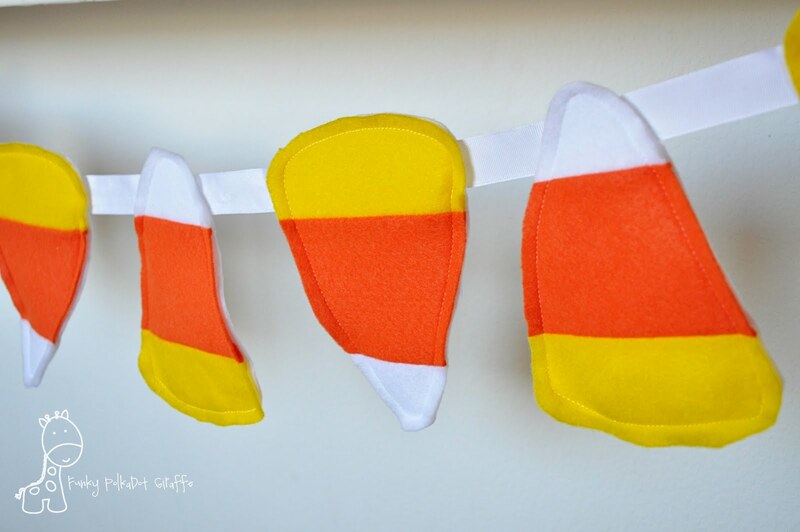 I heart candy corn too...this is too cute! I was just thinking a candy corn bunting would be fun for Halloween decor. This is so cute! Love it! Perfect for the season. I like leaves too, but these are yummy! Thanks for sharing ... I've posted a link. I thought this little bunting was ADORABLE and featured it here. So, so cute! 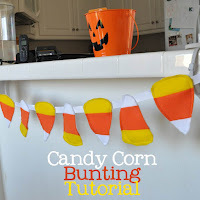 This is one of the cutest bunting tutorials I have EVER seen. I love it! I hope I can find the time to try it this fall. Thanks for sharing! Thank you so much for the idea! I posted the little one that I made on my blog after seeing yours. It isn't as big or as bright since I was using scraps...and didn't have as many scraps of felt as I thought, lol. but it turned out cute! hop on by my blog sometime too! 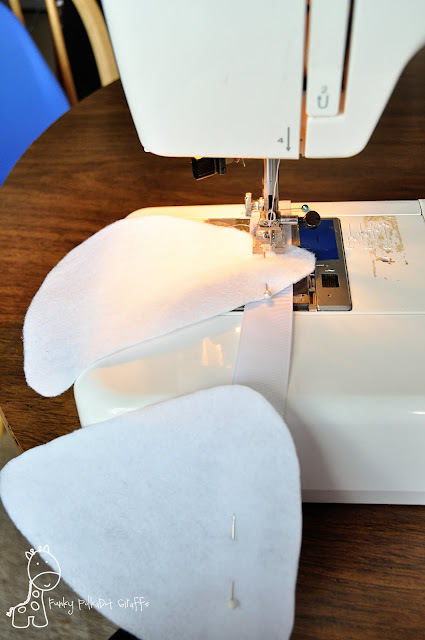 I received a newsletter from sew-whats-new.com that featured this tutorial. This is a very cute project! I think this would be a great project to dress up a classroom for a party. Thanks for posting this adorable project! This is going on my to do list this week! Thanks so much for sharing you're awesome creativity! Hi! I love this craft and I featured it on my blog, Tastefully Crafted. Great job! Love, love, LOVE it! Thanks for sharing. This is adorable! I definitely want to make one. Would you mind if I used a picture and a link blog on my "Candy Corn Crazy" post in October? Very cute! I love how they aren't all the same size. 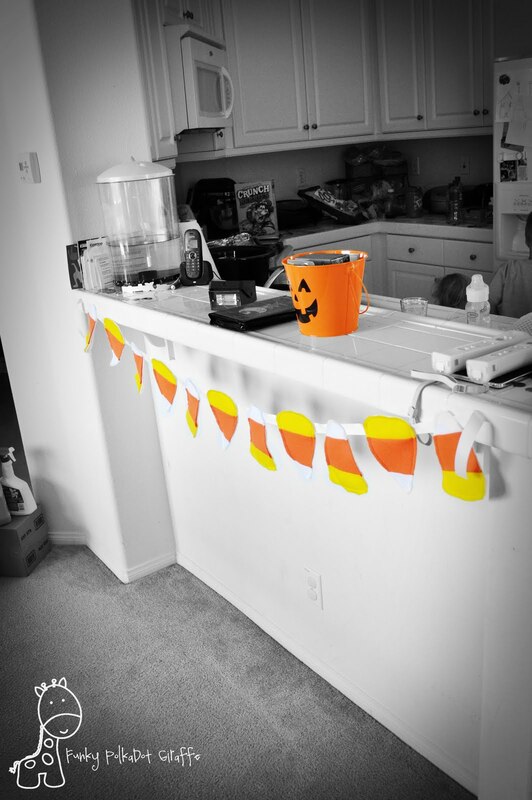 I made a pacman ghost bunting this year to get into the halloween spirit!http://bakingmemoirs.blogspot.com/2011/10/pacman-ghost-bunting.html Check it out if you get the chance! Thanks for the inspiration and tutorial Friend!!! Perfect!